Enjoy two full days of music, food and fun for the entire family. According to festival organizers Mike Gallicchio and Chas Kaplan, “We are going to top last year with more music and activities for two full days of fun for all ages. Don’t miss what has been hailed as America's largest food truck festival by media outlets across the country. According to festival organizers Mike Gallicchio and Chas Kaplan, “We are going to top last year with more music and activities for two full days of fun for all ages.” This marks the six year anniversary for this critically acclaimed foodie festival and there is something for everyone from tasty treats to entertainment to activities. 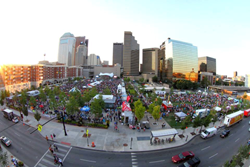 The festival runs Friday, August 12 from Noon until 10 p.m. and Saturday, August 13 from Noon until 10 p.m. at the Columbus Commons in Downtown Columbus at the corner of High Street and Third Street. Admission is free until 6p.m. on Friday and 5 p.m. on Saturday. Evening admission is $5 per person*. *Children 10 and under are free during all festival hours. Tickets can be purchased online at ColumbusFoodTruckFest.com or at the gate. The two day event not only features over 65 of the best food mobile food vendors in Central Ohio but will also have an arts and crafts area where vendors will set up with unique gift items, music on the Columbus Commons Bicentennial Pavilion Stage as well as the Groove U stage presented by Music Loves Ohio and children's activities. Saturday from 12p.m. to 5p.m. is officially Kid’s Day at the festival and is brought you by the non-profit organization Cornerstone of Hope. Children will enjoy a variety of activities including bounce houses, crafts, friends from the Columbus Crew SC, the Columbus Blue Jackets and hands-on activities. While the festival’s mission is to support food tourism in the vibrant downtown area and support small business, another very essential component to the the festival is to help build awareness and support local non-profit organizations that serve the Central Ohio community. This year’s festival hopes to build familiarity for Music Loves Ohio, a local non-profit that offers music education to children and Cornerstone of Hope, a non-profit that offers counseling and resources for families experiencing loss. “Both of these organizations give so much to the community and we want to support their efforts,” said Chas Kaplan co-organizer of the event. The festival will feature a variety of musical entertainment throughout the weekend including: DJ/MC Matty Sexton, Angela Perley and the Howlin’ Moons, Mr. Fahrenheit and the Lover Boys!, The Winnie Cooper Project, Doc Robinson, Introspect, Anna & the Consequences, Ladybird, The Fabulous Johnson Brothers, Safety Squad, Urban Tropic, The Cordial Sins, Jaclyn Hodos, Willie Phoenix, Brave and Weather Clave Sonic. A detailed line-up of acts and start times will be available on the Columbus Food Truck Festival website starting August 1, 2016. A detailed food vendor line-up will be available on the Columbus Food Truck Festival website Starting August 1, 2016.